Shirazeh Houshiary's film installation 'Dust', animated by our very own Mark Hatchard at Hotbox Studios, is taking a trip to the Big Apple. The animated film installation from the celebrated Iranian visual artist will be on display as part of her 'The eye fell in love with the ear' exhibition at New York's prestigious Lehmann Maupin Gallery from 30th October to 28th December 2013. 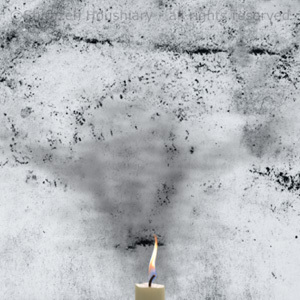 Dust combines the moving images created by a single candle burning. The haunting visuals are twinned with the meditative chanting of soprano Olivia Salvadori, whose voice moves from low to high to create an audio wave that conveys the past, the present and the future in a single moment. The exhibition also features a selection of new paintings and helical sculptures formed from aluminium. Dust was first exhibited at the Lisson Gallery (London) in 2011 as part of the Houshiary's 'No Boundary Condition' exhibition. This is the sixth time the artist has had a solo show at Lehmann Maupin. Houshiary's work has been displayed in major galleries around the globe and can also be found in prestigious public museum and gallery collections. If you haven't already heard the buzz, we'd like to introduce you to Head over Heels, a poignant new stop-motion animation destined for greatness. This superbly illustrated film about a couple who have grown apart after years of marriage is unique, not only by the way the characters behave towards each other, or rather ignore each other, but also by the fact that they are separated by a strange quirk of gravity. The husband, Walter, lives on the floor of the house, while his wife, Madge, lives on the ceiling. To describe the film in detail would spoil it, but fans of the Aardman Claymation films are going to fall, well, head over heels for this adorable slice of genius. Written and directed by Timothy Reckart as his graduation film at the National Film and Television School, the gripping nature of the 10-minute piece is all the more remarkable because it has no dialogue. Rather than working from a traditional script therefore, Reckart and producer Fodhla Cronin O'Reilly created detailed storyboards that were turned into an animatic during the intensive animation process. Eléonore Cremonese and her team of model makers had the enormous task of recreating a 1960s-style house, furnished on both the floor and ceiling with moveable props and appliances. The detail in the house alone deserves at least a handful of production design awards! The puppets are made from foam latex, stretched over a metal armature and painted with a mixture of latex and acrylic paint for flexibility (and presumably to cut Plasticine out of the budget). What is really impressive is that not a single frame is computer generated and even the background and sky were created by hand. As well as the dozens of awards Head Over Heels has collected around the world, the film has just scooped the Cartoon d'or at the Cartoon Forum in Toulouse and has already been nominated, quite rightly, for an Oscar. A brilliantly mesmerising and superbly simple new video for the garage punk band China Rats sees those pennies we all keep in a jar put to good use. This stop-motion animation from director Richard Swarbrick takes the title of N.O.M.O.N.E.Y quite literally. The video was created over 15 months utilising live footage of the band overlaid with small change, bank notes and hand-painting. Swarbrick explains: "At the time I'd been working on a series of stop frame animations made out of found objects (bits of string, buttons, bottle caps etc) and I immediately had the idea of doing something made out of money. At home I had a 'man draw' full of coins so I set about working on animation tests". Artist Swarbrick previously created similar visceral and frenetic animations to illustrate great sporting events such as Maradona's goal against England, Rooney's overhead goal against Man City and Murray’s Wimbledon win. The UK's largest and longest running animation festival, the Bradford Animation Festival, this year celebrates its 20th anniversary. The event will be held between 12th and 16th November at the National Media Museum, with a birthday gala drinks reception kicking off proceedings before a special screening of Tim Burton's magical musical The Nightmare Before Christmas. The festival will pay tribute to Bob Godfrey, who introduced us to the bizarre worlds of characters like Henry's Cat and Roobarb and Custard. A special discussion panel is being assembled to talk about his work, after which visitors are invited to attend screenings of some of his rarely seen films, such as the unfinished Frankie Howerd-voiced animation, Jumbo. Deb Singleton, the festival's director, said it is remarkable just how far the world of animation has come during the past two decades. She added: "As well as looking ahead by delving into cutting edge animation techniques and watching the latest films, we'll also be paying tribute to those legends of animation who are sadly no longer with us, including John Coates, Bob Godfrey and Ray Harryhausen." Stop-motion genius Lee Hardcastle will also be in attendance, hosting a master class on the techniques he employed to create his soon-to-be-released short film, Ghostburger. Other artists showcasing their work and taking part in question-and-answer sessions include Mandy McIntosh, Elizabeth Hobbs and Sean Vicary. The Guardian has employed a simple cut-paper animation to explain the complex theories of Professor Stephen Hawking. The charming short sees Prof Hawking and his colleague Roger Penrose take us on a journey to the centre of a black hole and back again and across a pencil-drawn universe littered with equations, light bulbs, rockets and even elephants. The story is pushed along by a real pair of godlike hands that provide practical examples of theories, such as explaining singularities by crumpling up paper to a point of infinite density. Dan Porter, creative director of Scriberia, the animation company that created the film, told fascodesign.com: "Our work is often about trying to say more with less - finding the quickest, most elegant way to communicate often very complex information." The idea behind the Hawking animation was to make the ideas as accessible as possible by utilising the sort of materials that can be found in any classroom. Porter added: "We're trying to create visuals that will help people retain information, so sometimes the wildest ideas are the ones that are going to stick". Guardian multimedia editor Paul Boyd explained that by fusing art, design and science, the video will appeal “to the emotional side of the brain, not just the rational. Learning is easier when you’re laughing”, he said, adding that “there are science in-jokes throughout” for the more informed (geekier) viewers.